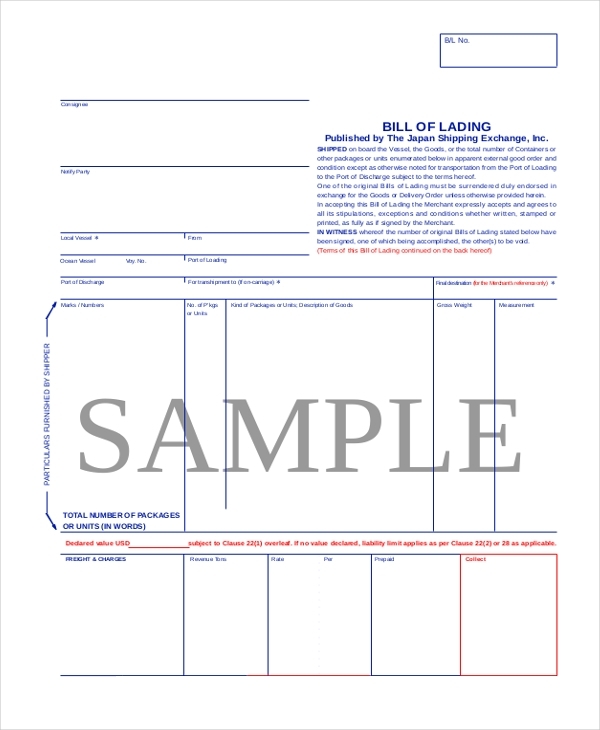 A bill of lading is often referred to as BoL in common parlance. When you receive a piece of cargo, there has to be an acknowledgment slip that recognizes the fact that you have indeed received it. 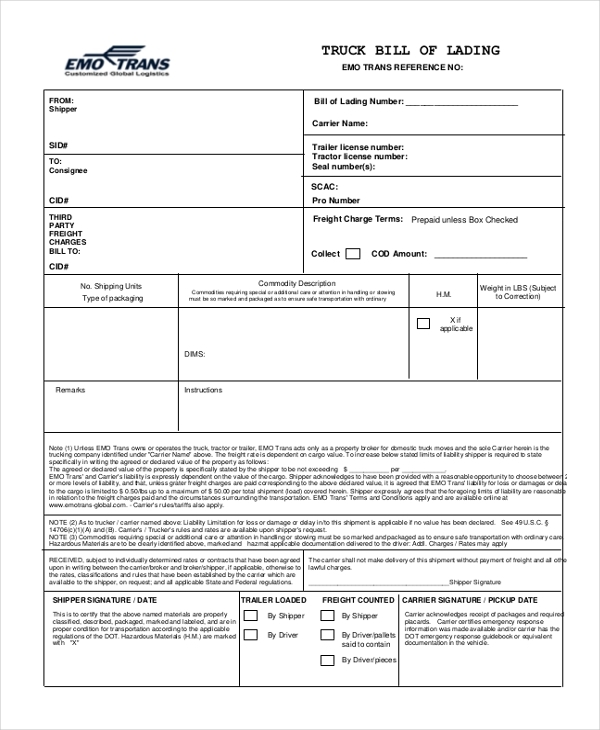 Now a bill of lading usually has a fixed format that you must follow under all circumstances. If you are not aware of this format, then you need to take a look at some of these Bill of Sale Forms provided here. 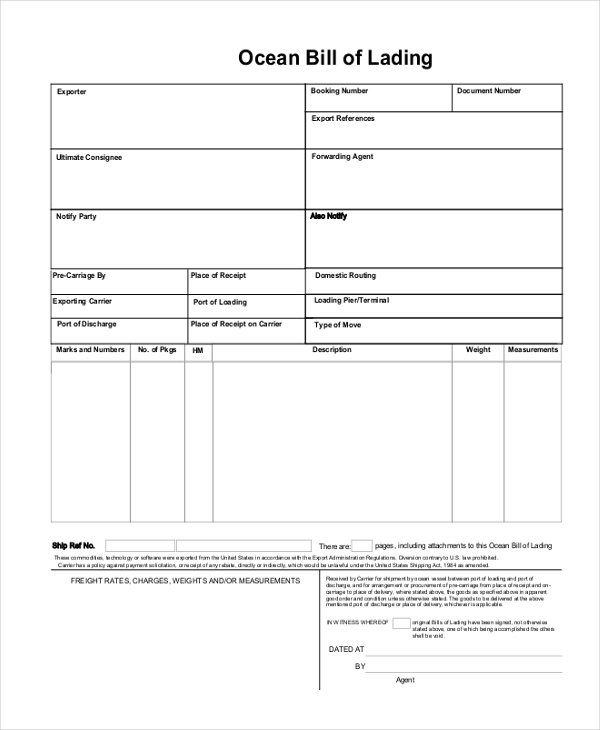 When it comes to official documents of any kind, you must take a look at some blank bill of lading documents. That way you get to design your own format as well. 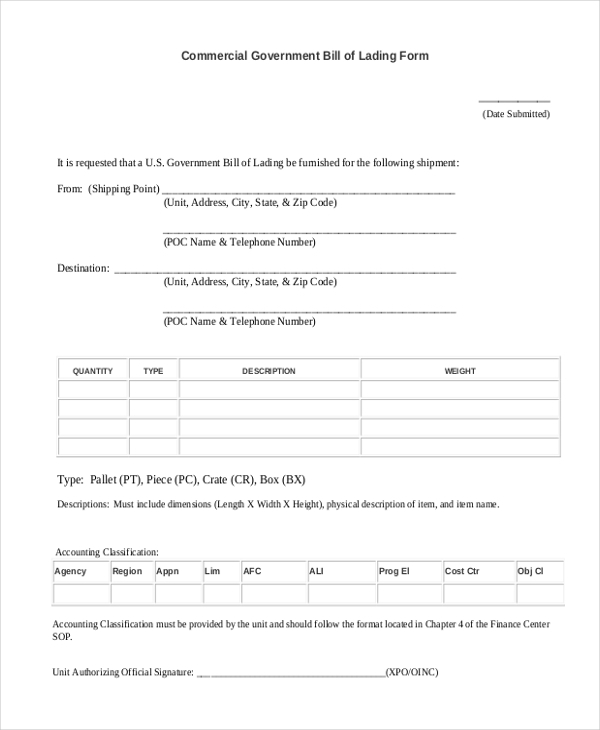 This bill of lading template that you see here comes in a neat and well-organised pdf file. It also comes in a format that is not only easy to print but also easy to use as well. You may also see Car Bill of Sale Forms. 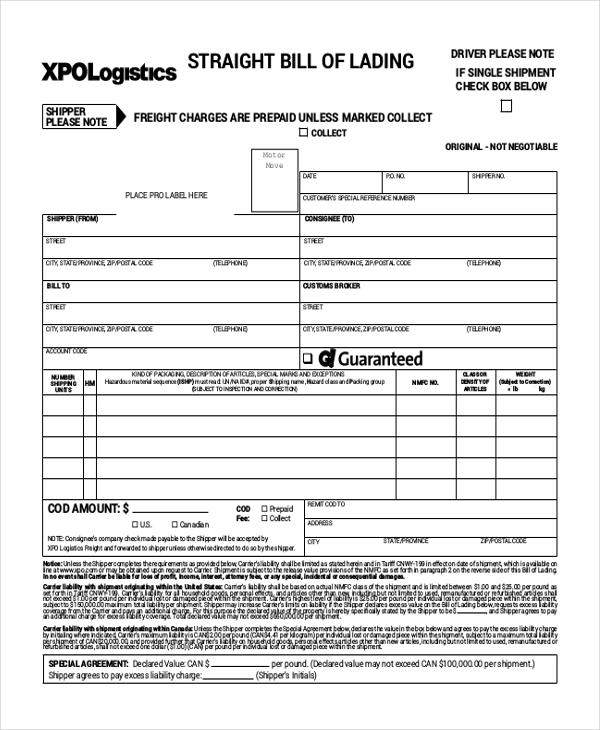 This bill of lading form comes in a PDF format. That provides you with a great sample of what the document is actually supposed to look like and how you can organize it. You can also see Horse Bill of Sale Forms. 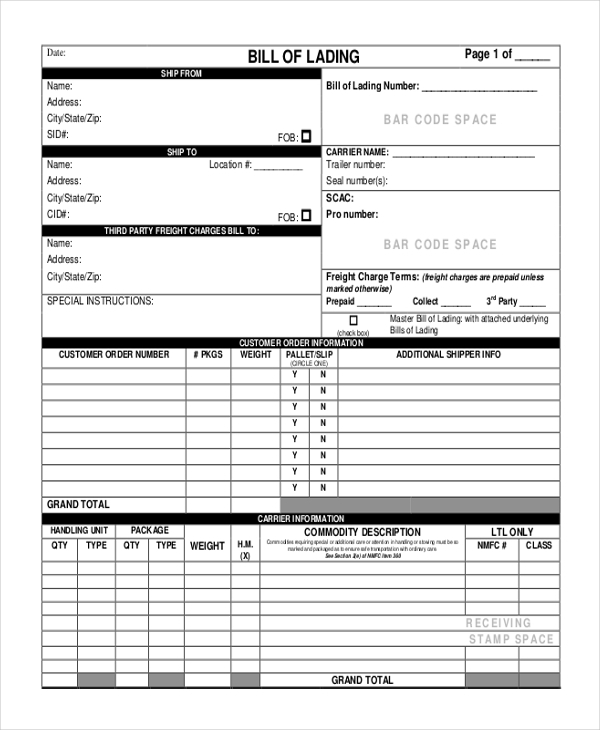 This bill of lading form is a standard example of what such a document is supposed to look like. It is well organized, neat and easy to use. You can use this template as a sample as well. 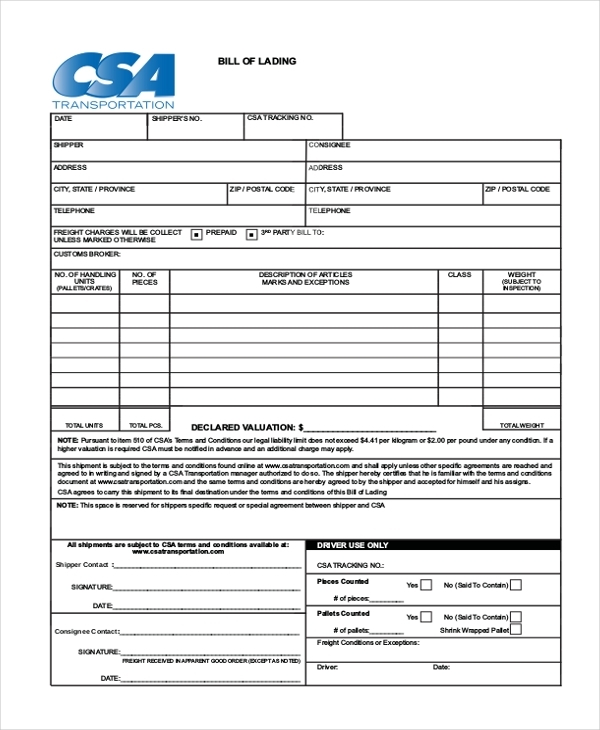 This bill of lading form may be used in the form of an acknowledgment slip while you deliver cargo. 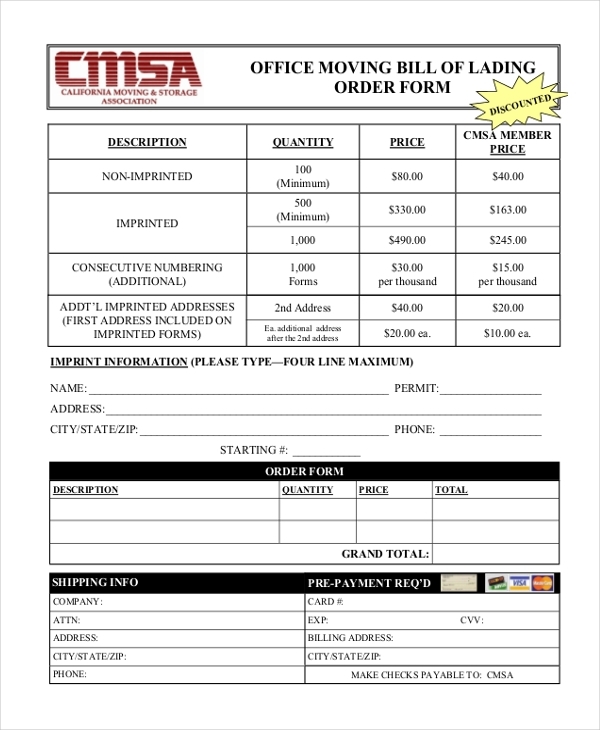 In that case, you can use the bill of lading template as a sample here. When you shift offices, there is, of course, going to be a huge amount of cargo that is shifted. To make sure that the transportation takes place seamlessly, you can use this template. 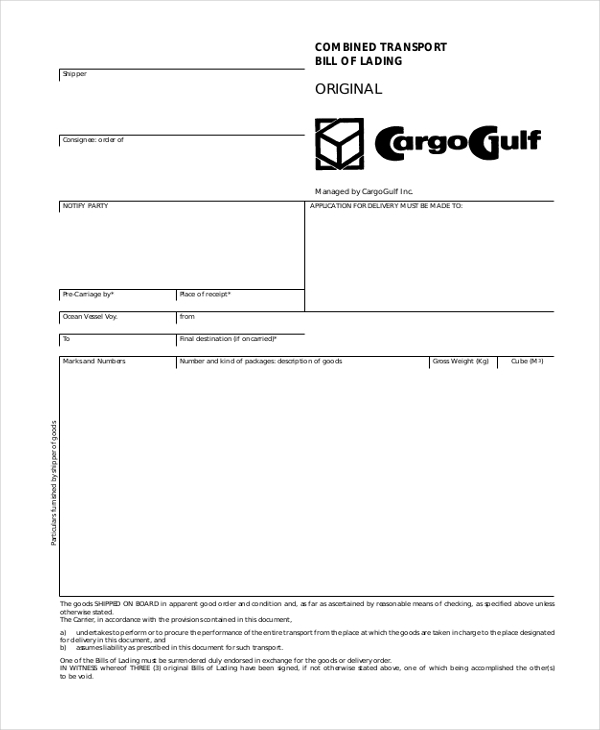 This bill of lading template here contains the apt format for such a document. It contains exactly what such documents need to contain and not a word more. Also, it comes in PDF format. 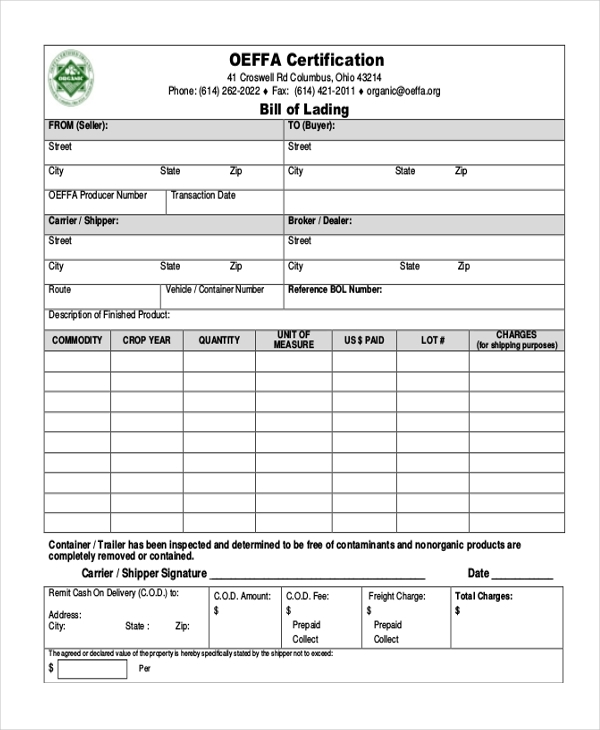 You can also see Equipment Bill of Sale Forms. If you are shifting homes, then you will need to shift your cargo from one place to another. More importantly, you will have to sign a bill of lading document to do so. This template here is the perfect example of a commercial government bill used for this very purpose. It comes in a PDF format and is ready for print as well. 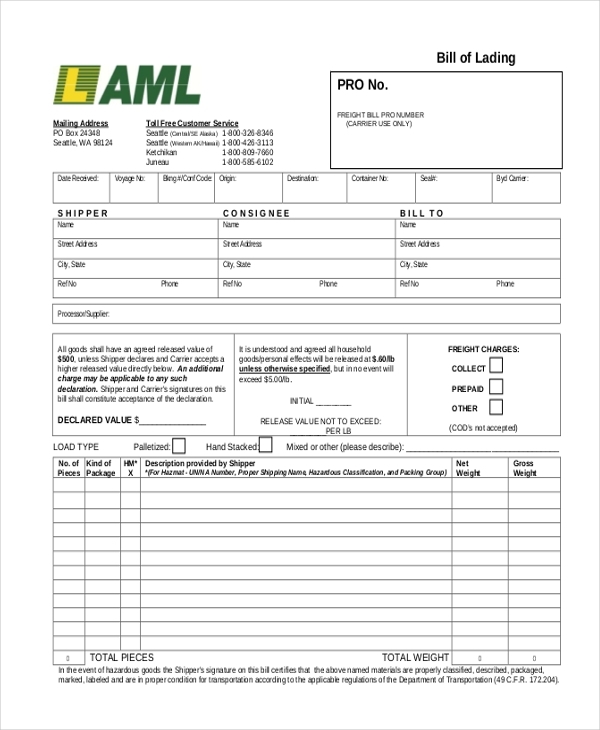 This is an example of a bill of lading template which may be used by those in charge of transferring the cargo from one place to another. Also, the template is very easy to use. The templates that you see here come in a variety of formats. More importantly, they cater to a number of different situations. Thus, you would be able to use the various bill of lading formats based on your needs and requirements. Also, the templates here have been developed by a bunch of professionals who know exactly what you want or require. You may also see DMV Bill of Sale Forms. 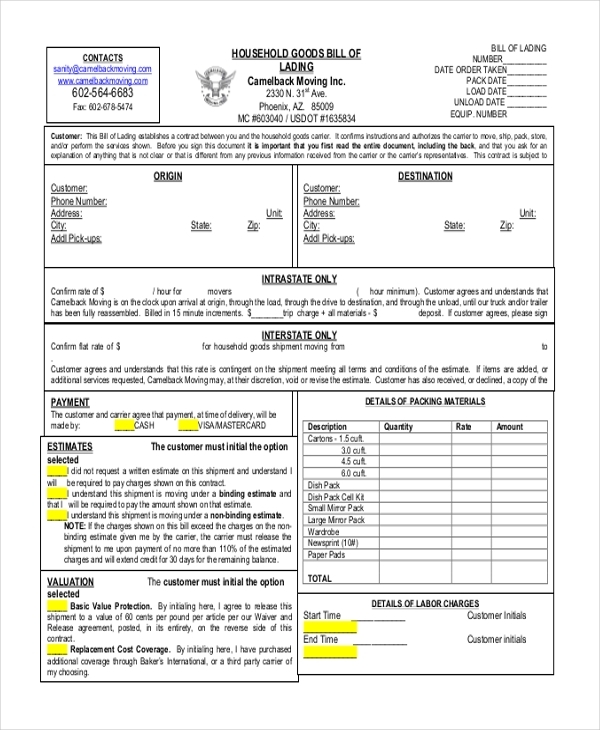 These bill of lading templates are official documents that must be developed with utmost caution. Let’s take a look at some tips which can make the process a whole lot easier for you. While creating a bill of lading, make sure you have an idea of what it is supposed to look like or what it is supposed to contain. That way you avoid chances of error for sure. Also, check your data. You would be allowed to make some changes to the data accordingly. Are you in charge of cargo transportation? Then you must be needing a bill of lading documents on a regular basis. In that case, you should definitely take a look at some of these templates here. They have been designed by a bunch of professionals and would be a great way to avoid confusion later on. 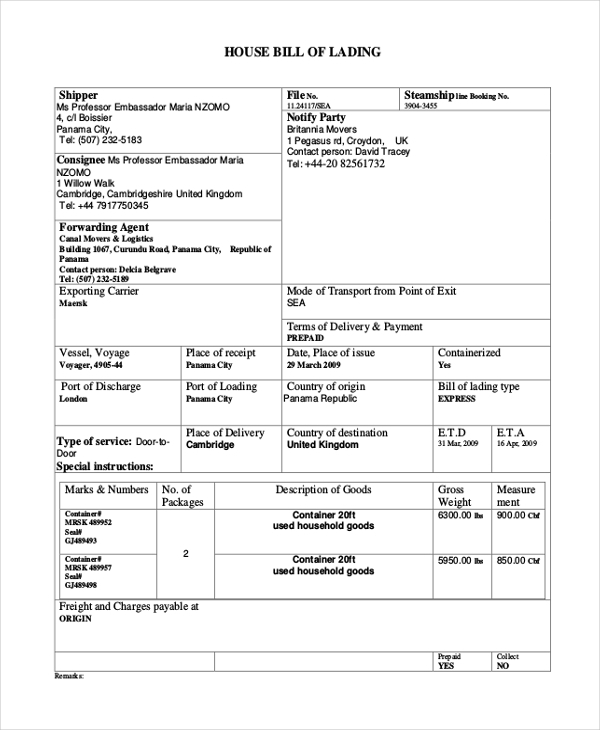 You can also see Boat Bill of Sale Forms.